The book was amazing, and full of quotations that one could hurl like a javelin. Hear and attend and listen; for this befell and behappened and became and was: O my Best Beloved, when the tame animals were wild. There are few things sweeter in this world than the guileless, hotheaded, intemperate, open admiration of a junior. Even a woman in her blindest devotion does not fall into the gait of the man she adores, tilt her bonnet to the angle at which he wears his hat, or interlard her speech with his pet oaths. 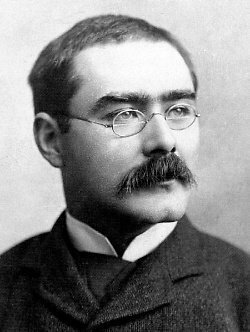 Bio: Joseph Rudyard Kipling was an English short-story writer, poet, and novelist.